but somehow it also passed in a blink of an eye; as if time somehow dilated and distorted, aging me 100 years as the world around me moved at a normal pace. It's hard to describe, and still a little hard for me to believe. I remember two years ago, just starting school and having moved across the country, boxes and boxes of Orion: 1's arrived and I began shipping them from my AirBNB basement room. I was also nervous I had made a mistake, maybe I shouldn't have spent all that money on hundreds of watches with a non-traditional design. I was wrong. All of you proved me wrong. Going into watches and horology may have been one of the best choices I've made. Sure, my vision is a little worse and more of my hair may have fallen out over the countless 60, sometimes 70 hour weeks over the past 2 years, but I learned an incredible amount. We learned how to form hairsprings. We learned how to refinish cases and bracelets. We learned how to machine things on the lathe, often having fabricate replacement parts or make repairs ourselves, the lathes older than some of us. We became problem solvers. We learned the properties of metal, how to temper and quench it, understand it's properties when given different surface finishes. Some of us even learned to quench our tempers, as hours and hours of labor could often be undone in a single moment; a slip of the graver, too much play in a worn cross-slide or milling attachment. We all grew and learned together. Many of us will go on to different parts of the country, or world, pursuing different paths, beginning careers. Feeling the top of our game only to be humbled again by the real world, problems that we've never witnessed in school. For me, I made a deal with my supporters, as Orion was blossoming (it was a tough germination!) I promised that the goal of Orion:1 was to support my tenure through watch school, as I write this, it has been a huge success, only 5 left in stock. I'm amazed, I'm humbled, and I'm so happy to have a wonderful group of people supporting me. I'm sorry if i was short in messages or missed your e-mail out right, I often found myself going well into my sleep budget these past 2 years. I digress. The Orion Project was a huge success, and I was scared at first, but now I'm confident. So what's the next step? The Orion HQ. I'm looking to buy a place to setup as a shop and base of operations (I'm looking at you, Denver!). Here's the plan: I want to manufacture horology here in the USA, but if you don't strike with precision, that's something you could squander millions on and still not make any real progress. 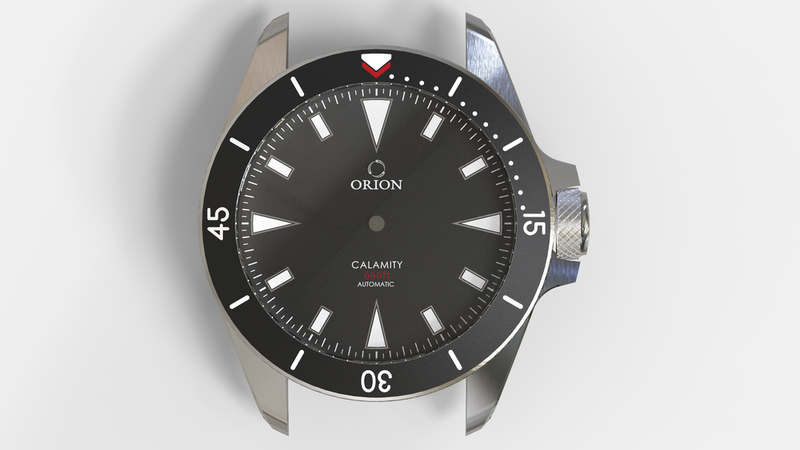 The Calamity and upcoming Orion II, not only are a promise to innovate and push boundaries on watch design, but will fund tools and machinery as well as the Orion HQ itself. Once the base is setup, the aim is to not only work on developing the skills and team to do everything in house, not yet, but to become an independent service center. With Orion II and Calamity's moving, watch repairs coming in, I'll be able to grow Orion and most importantly, hire Team Orion. From there, making use of global manufacturing and our servicing we'll begin manufacturing products and learning what it takes to do everything ourselves. See that channel worn into the pivot? Before I started this journey I was daunted, my goals seemed insurmountable-but I had to try. I know now, what lays before me will be an even greater challenge. And I couldn't be more excited to step up to the plate. Lets keep the momentum going, and I'll see you out in the world. The watch industry is small. Which means many things, especially when it comes to going places for manufacturing your watch components. 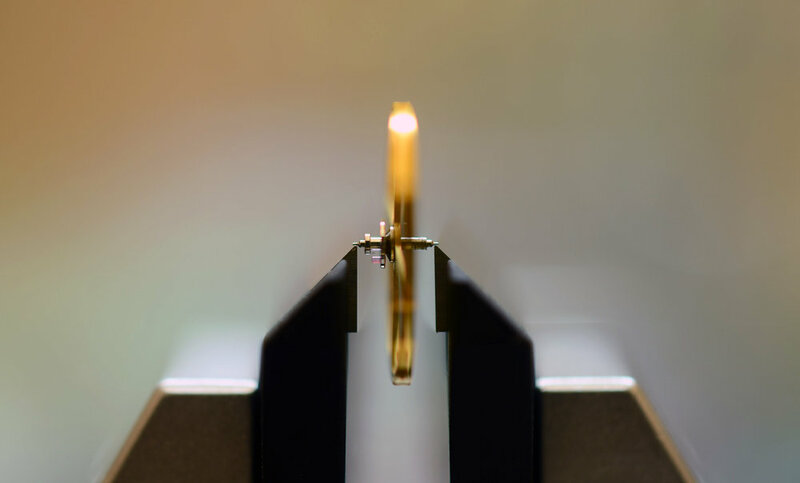 The majority of watches have their hairsprings fabricated by a single company, Nivarox, that if disaster struck, the mechanical watch industry (save a few companies) would be devastated. In fact, many brands share manufacturers in some capacity, you may be surprised that Swiss Made does not incur the same 100% made like the branding Made in the USA, allowing them to have international manufacturers and still brand their product as such, though that's a discussion for another time. The watch industry is small and the manufacturing equipment and skills are specialized and rare, not mention expensive. In recent history, there's been the advent of Microbrands. Generally, microbrands, as they've become to be called, market and sell watches under $1,000. The most successful of these brands ranging from $250-$750. Why is that? What are the confines of a microbrand that prevents them from moving beyond that? Many micros use Asian manufacturers for large portions or all of their fabrication. Many brand owners may lament the challenges of finding a trustworthy and quality manufacturer, some may go so far to dissect their supply chain. The thing with manufacturers and watch factories is that many of them will state that they have the capabilities to make all the components, while true, they may only specialize in a couple components. A factory that can produce excellent cases may produce very low quality hands, now you could compromise, or you could find the company that specializes in hands and have them made there. Searching for the best of each part can be time consuming and you very quickly find yourself dealing with lots of logistics, but if your goal is quality then this is important. Which is where the vendor steps in, there are folks whose jobs are to coordinate between factories to find the best of all worlds for you and your product. As you can imagine, they'll form relations with factories and they'll default to them, which can again leave you searching for a new factory capable of what you desire. The people who've been in the micro world for a while have most likely been through a few different factories and vendors. Though the relationships one cultivates with their production chain can often be...interesting, at least until trust is developed. At any rate, many successful brands find themselves going through different factories or vendors until they find something good enough, and in a small industry it's not just chance that many of them stumble upon the same or overlapping supply chains. What does this mean for the consumer? Many microbrands will have a product that feels similar in finish and perceived value. Manufacturers know what they're capable of and they stick to it. Maybe you've owned watches from different brands but the texture of the steel felt similar, the brushing depth and grain appear to match, maybe even parts look similar. It may not be coincidence, they may be from the same factory, additionally, they could be catalog parts (parts which exist in a manufacturers catalog, the dies are already cut). Folks may choose catalog parts to circumvent mold costs and tooling fees, which can add up. The issue with catalog parts is that they don't inject new creative design into the industry and have the potential to leave designs feeling stale or derivative. Which gets to my next point. Sharing a manufacturer or vendor, with people in the same or proximate market as me, seems very risky. I've witnessed in other industries, larger companies bullying other smaller ones once they've learned of shared production sources. Imagine you're a small company but an industry giant shares a factory with you, they could very easily leverage the factory to make your product lower priority or otherwise delayed in favor of their own (since they're big time customers), as well as many other things to stifle business. With international design and manufacture, design theft becomes a different story, which also plays into the trust you have with your vendor/manufacturer and folks you may be sharing the house with. For Orion, it was very important for me to not share with folks that I know or brands that are in the same space as me, even though I'm on good terms with a good number of them. Avoiding sharing is largely a safety precaution, but it also gives my product a different feel from other brands that share manufacturers, especially case and hands manufacturers. The Orion: 1 case is often lauded for having exceptional finishing, seeing as it's not a catalog case (Orion does original design, no catalog parts here) and I don't use the same factory as many other brands plays into it as well. You may see where this is going. As more and more microbrands crop up, talk and talk, do their research on where to go to have their watches made they'll find the same places and their product will inherently have a similar feel, whether it's from a catalog or just the quality that the factory is comfortable with producing. Which gets to the next point. As I mentioned earlier, micros have a pretty good hold on the sub $1000 pricing bracket, and for the quality that most of them put out, that's find. And the consumer knows that too! They also know that quality doesn't really match up with the watches over $1000, so there's an inherent skepticism when they see one. This is because lots of micros are totally happy with defining a price range for their watch and holding that ground. Which is fine, but I'm not, I need to improve, I don't want to be limited by certain aesthetics, techniques, or movements. Though, with the small pool of factories microbrands have inadvertently placed walls around what they're capable of and have cultivated a consumer base that adheres to those confines with expectations that aren't consistently broken; until now. Microbrands dominate the sub $1000 price range. Consumers expect this. Micros stagnate and don't push forward, unable to contend with larger brands with higher quality. Microbrands are scared and reluctant to depart from catalog parts. 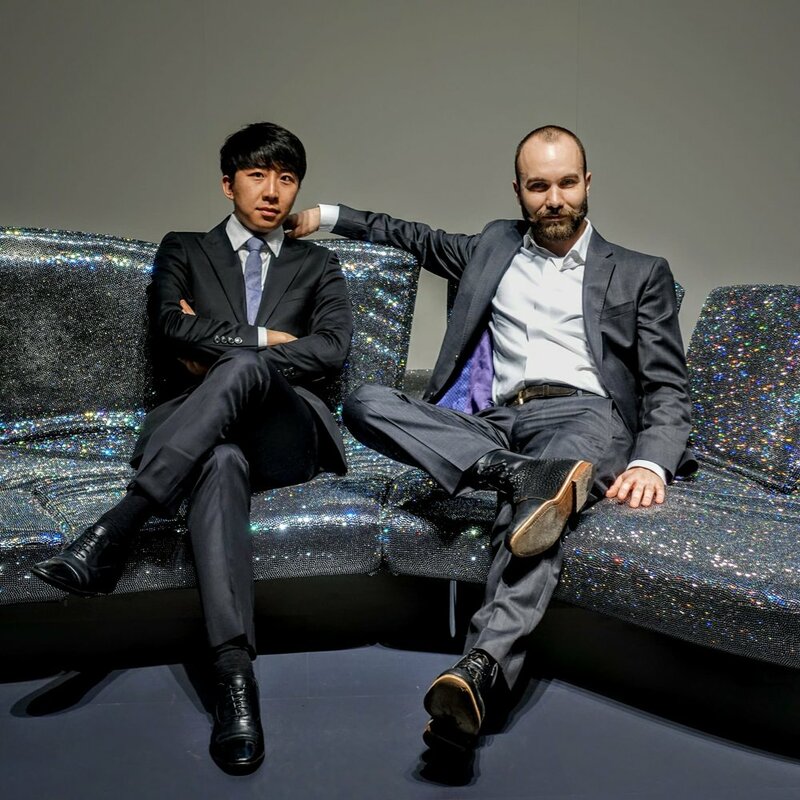 Reluctant to push their factories to develop new manufacturing techniques, because it's expensive and they are unsure of the results. In my mind, I see a bit of a feedback loop here. It's not the Orion way to stay in one place and stagnate, I'm aiming for US manufacturing, I'm aiming to innovate, to innovate. The future of a good chunk of the industry depends on the two aforementioned behaviors, micros willing to take more time investing in innovation and new design and consumers being more receptive of what that looks like. Years ago I balked at watches over $1,000 and rolled my eyes at brands like Rolex or even more expensive haute horology. Having immersed myself in watchmaking school and horology based communities I've learned so much. I've learned about the challenges brands face, the challenges of certain techniques, and in turn, I've grown to respect them. I also respect the pricing of more and more brands as I grow to understand what they're doing and the work involved. Educating myself has also honed my BS detector, and looking back at myself when I knew less, I regret some of the views I had as they weren't based in complete understanding of what drove the forces at work. I want to invite people to be curious and not accusatory. I want to invite designers to strive to inject new design forged by the fires of their passion and not just grab at someone else's work for an easy sell. I want to team up with everyone to make an awesome future, beyond just watches. In between all my regularly scheduled madness I'm hoping to boot up a YouTube channel with some short, educational videos. From hobbyist tinkering to horology. So far there are two; a tutorial on proper sizing and care for your Orion bracelet and a pressure testing video. As with all new social media avenues, likes, shares and subscribes help them take off and reach their maximum utility as an educational tool. So if this is something you enjoy or think people should see, you know what to do! It makes a difference! If there's a certain tutorial or technique you'd like to see done, please leave a comment and give us some ideas!! Four years ago I discovered my passion for horology on a whim, thinking I could simply repair an heirloom Omega Constellation. A year and a half ago I began formal schooling at Watch Technology Institute in Seattle - this August I'll graduate with 9 other people, then, it's on to the next phase of Orion. What is the next phase? I've mentioned that I want to bring more horological manufacturing back to America. My end goal is to be able to completely manufacture all components of the watch here in the USA. Made in America, 100%. That's easier said than done. Upon graduating I want to jump right in. I want to find a barn (or maybe I'd settle for a church) and convert it into a watchmaking facility. I'd also begin assembling my team. With the new Orion 'Barn' we'd start modifying and manufacturing individuals parts or parts for movements. This would impart the technical skills and knowledge needed to move forward. Piece by piece, we'd add more manufacturing equipment. As our skills and assortment of tools grow, so will our production capabilities. So the Calamity. It's a heavy hitter and a serious watch in terms of design and components. Just as the Orion:1 and Field Standard have and continue to fund my tenure and life at the Watch Tech Institute, the Calamity will be the first step into life beyond school. Profits will go towards funding the Orion: Barn, horological equipment, and the salaries of my team. Whether or not you believe in my goals or visions, you have my word that I will continue to push forward, find those boundaries, and break them. It is with the continued support of all of you, that this is possible. Here's to the Calamity, the future, and you, my support. The Calamity is more than just a dive watch. It's a watch design that's ambitious and wont cut corners. In a bit of an unorthodox turn, the prototypes are being redone. While this will add some time to the release and pre-orders, it's being done to ensure that these watches are the highest quality. Rushing a watch through production and taking gambles on quality and small issues being rectified is not a risk the Orion, or I, will take. or close to it. This watch will be a contender with some of the more well known big hitters out there, not just in terms of quality, but in terms of innovation and new design. A dive watch so ergonomic, light, and slim that you forget you have a watch on? Yes please. I had not much money in my bank account, no clue as to how well my oddball design would be received and only my Seiko modding background to vouch for me. As you know, things like the bracelet had to be delayed from the original release and small design concessions were made so that I could realistically turn an idea into a real watch. This will not be the case with the Calamity. The Calamity will come out, and from day one, will be a force to be reckoned with. Calamity prototypes should arrive in a couple weeks! Most likely a darker shade of blue will be selected. This month the prototypes for the Calamity should arrive. While they will be largely the same as renders there will be a couple small changes, like to the indice design and drilled lugs (drilled lugs make the thin case too weak!). Lets review some specs though as manufacturing draws closer. Case thickness 10mm to 11mm, remember the curved caseback. This included the crystal thickness. Once the prototypes are in hand I'll be able to make more informed decisions on final revisions and pre-order date. With any luck we'll be able to begin pre-order this fall and have them on your wrists in the spring or early summer. Current estimates place retail around $1,500 with pre-order backers receiving a discount. I'm excited to develop and release a slim profile, reasonably sized, and unique dive watch. 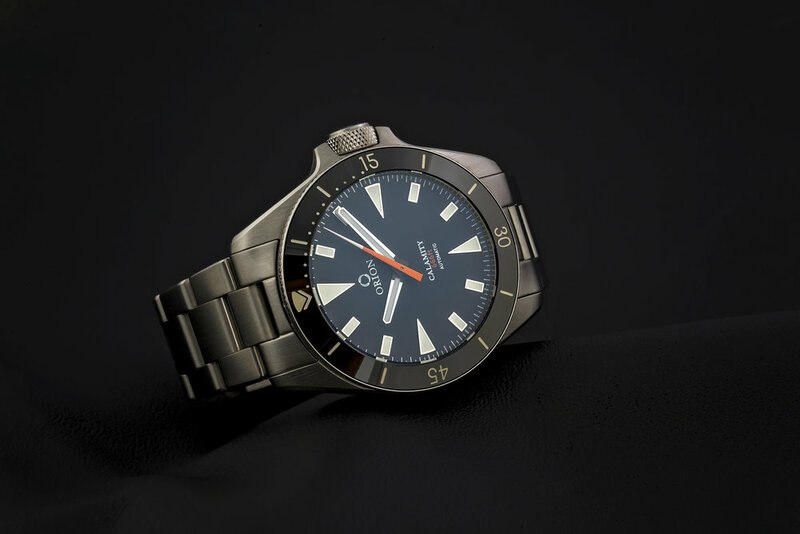 The Orion aesthetic and technical specs, I believe, really sets it apart from the much more commonly designed chunky and large divers. Working on the CALAMITY in its blue form, just need some input from all of you on which shade of blue you prefer! Is is the lighter blue or the darker blue?? The first two images depict a lighter shade of blue while the second two are a darker shade. Of course they both evoke different feelings and create a completely different watch, both of which are nice on their own merits, but lets get down to it, WHICH ONE DO YOU LIKE BETTER?! Design phase is nearly complete! Then it's onto prototypes. The Calamity, if you don't know by now, is a dive watch. The design is very much a fusion of modern and vintage styling, but is still easily recognized as an Orion watch. So far the plan is for two different versions, a red/black and a blue/orange. One being more low key, while the blue and orange will be high contrast and more of a stand out. The case diameter will be a reasonable 39mm, with a lug width of 20mm. The bezel will be a matte ceramic which will match the matte dial. Case finishing will be a straight grain brush finish along the tops and sides of the case but with a polished tapering bevel along the dorsal and ventral sides. Hard to see in the above photo, but the caseback will curved, to hug your wrist even more comfortable and to maintain the slim curvature of the watch. It will be powered by the Swiss ETA2892, a thin and smooth winding and setting watch. 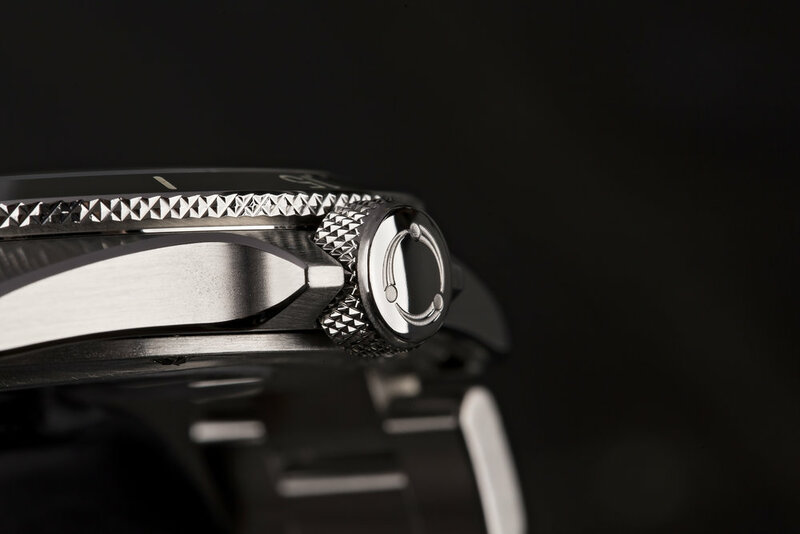 The smooth winding obviously suits the large Orion crown and the thin movement allows us to achieve a case thickness not commonly seen in dive watches. The 2892 is a tough and high quality movement, regarded as higher quality when compared to the well known ETA2824. The Calamity will ship on a stainless steel bracelet, with plans to produce a fitted silicone strap after production is finalized. 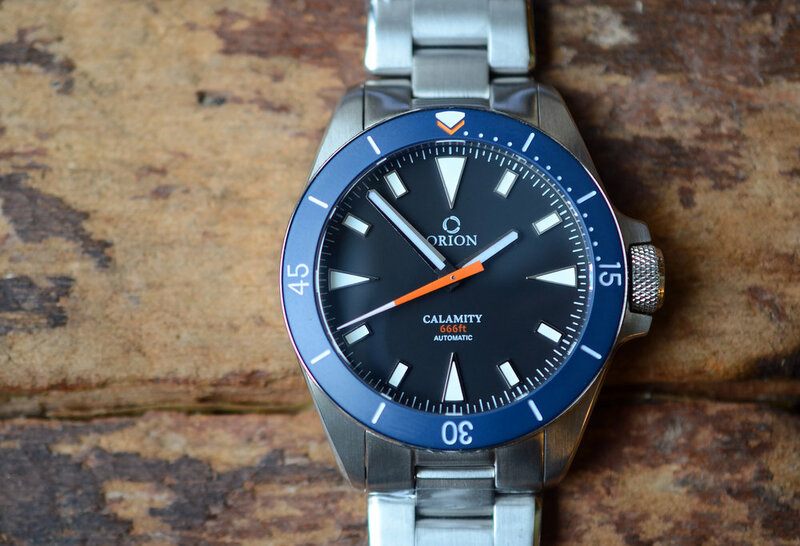 I'm excited to announce the Calamity, a dive watch that definitely stands apart from the norm. Is the weapon of choice for fine sizing, burnishing, and polishing pivots. It's hand-powered via the small bow, and invites imagery and sensation of watchmakers from generations past using a similar tool. It's crude yet elegant in design. You mount your gear with a pivot in need of burnishing, or in the example here; some raw cut pivots. We made small brass carriers for the 'ears' of the dog to lock onto. You can see the bow twisted around it. As you operate the bow, it spins the dog, which the ears engage the spokes of the gear or in our case, the long screw of the carrier. 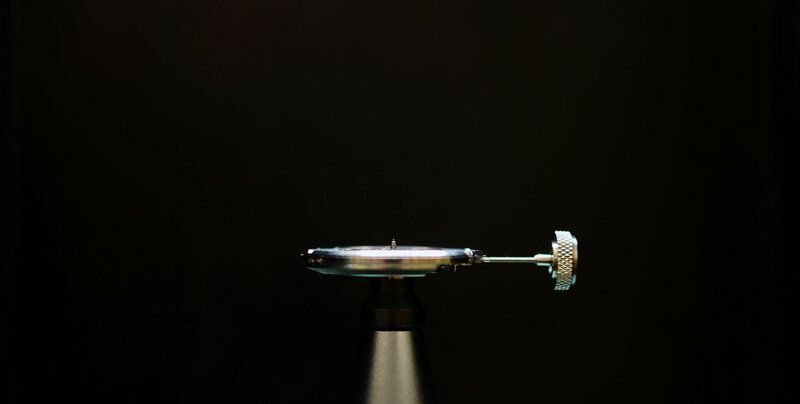 In motions opposite of your bow, you place your burnisher atop the pivot which rests in a lantern collet slightly smaller than the target you plan to size your pivot to. For example, you want to cut your pivot to .25mm, you'd use a groove in the collet sized to .22mm or .20mm. That way the burnisher doesn't bottom out and some material of the pivot sticks up, able to be cut. Is needed to not break, deform, or taper (and any other number of things) your pivot. You must be focused, relaxed, and patient when cutting and burnishing pivots. Rough cutting is done on the watchmakers lathe, expect a couple pivots to break, so make extras. Frustration will only impair your ability to do good work, stay centered and remember that breaking pivots is normal. It is here that numbers need to be exact. A piece of dust or oil on the pivot or your measuring device can obscure an accurate reading. If your pivot isn't sized perfectly it wont function. Generally pivots are .25mm and under, even handling them takes a bit of learning. WHY IS A BURNISHED PIVOT GOOD? A properly burnished and polished pivot not only has less friction but it wears less over time. The act of burnishing actually compresses the metal, making it denser and harder to corrode. Many brands and movement manufacturers have acid washed and tumbled pivots, this technique is cheaper and creates a hard outer surface, but once that hardened surface wears through, the softer insides degrade quickly. This is where burnishing shines, it's a rare practice, a good repair technique and an extreme challenge to master. 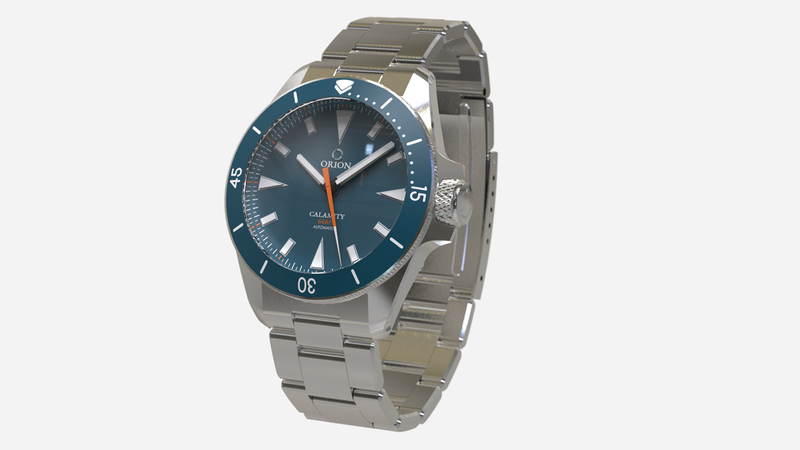 When the Orion Watch Project was started, it was done so on a very very small budget and capitulated on funding from early supporters through the pre-order. Certain concessions were made in order to make that goal more attainable; one of them was the inclusion of the bracelet. I wanted a high quality bracelet with solid links, screw links, and well, just solid everything. They aren't cheap to manufacture. Now though, they are becoming a reality. I just received prototypes for the 3 bracelet variations that certainly complete the look of the Orion case and provide the additional function of "knuckle duster". These things are heavy and completely transform the look of the watch. 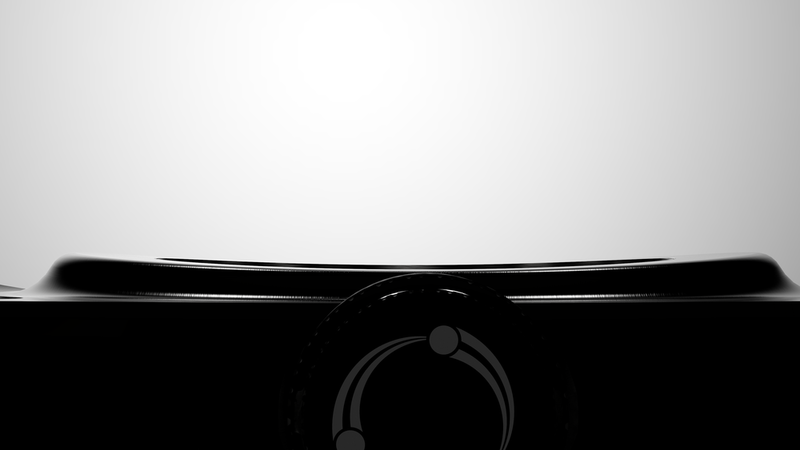 There will be a polished center link model, all brushed, and a DLC black version. These will be offered independently as well as a standard inclusion with a new watch purchase. A curved caseback will contour this slim profiled watch to your wrist. The funding goal has been reached and the Field Standard is being produced! The target for mid spring is still on! Of course, I have a few really exciting special editions planned, but with a total of around 100 pieces, there wont be many of these in circulation. You can expect a fresh new design. No homages. The Orion crown that you love. Sapphire. Ceramic. 200 meter water resistance. Bracelet. Nuclear lume.